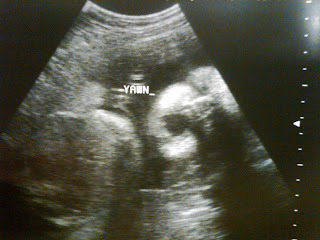 I was pretty excited about going to my doctor's appointment today because we were going to have another ultrasound. The last one we had was in November when we found out she was a girl. I knew so much would be different. However, I wasn't excited about having an 11:30 appointment. Usually I make my appointments early in the morning so I can be the first patient and get in and out of there. But for some reason, they wanted to see my at 11:30 this time. I hate late appointments because there is never any parking and I have to drive around until someone comes out of the office and I have to stalk them so I can take thier spot. I also hate it because I know the waiting room is going to be packed. Today was no exception. Noah met me at this appointment. We waited and we waited. Finally we got into the ultrasound room an hour later. I came out with some really great pictures of Ava. She was quite a little wiggle worm and she had the hiccups. So sweet. 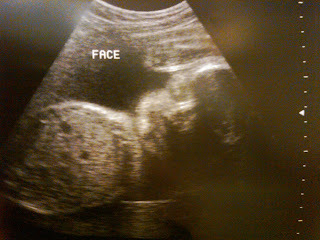 We got to see some really detailed features in her face. It was amazing. 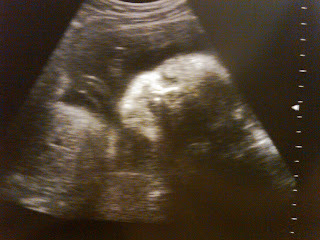 Of course it is too early to tell who she looks like, but she looks like she has a cute little nose and no hair yet. She kept opening and closing her mouth and at one point she was so curled up she kept poking her forehead with her foot. At this doctor's appointment it really hit home for Noah and I. We only have 12 more weeks to go! If that, because she could come early. I am getting more and more excited. Yeah I don't know how many ultrasounds I have left, but this one was amazing! We are driving either on Friday or Saturday morning. I think we may be staying until Wednesday. Anyways I wanna see you and your growing belly :) I'll call you when I get into town.